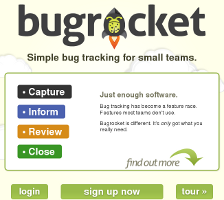 Bugrocket.com is a simple issue tracking system designed for small teams. 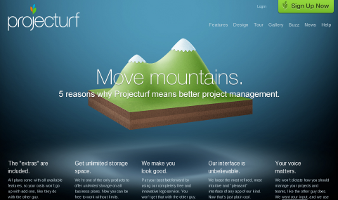 Built upon the idea that too many features can sometimes stand in the way, Bugrocket aims to simplify bug management and to keep things easy to use. The bugs are organized into lists, and lists are grouped into individual projects. Each bug has one out of 4 possible states (triage, assigned, QA or closed) and it can be tagged with free-form words for easier retrieval. The app gives to each client a personal subdomain where his bugs are being tracked. The first 30 days are free; beyond that the app costs $20 / month, with unlimited users, unlimited projects and 25 GB storage space. More comments on the pricing model are available in a HackerNews discussion thread. The friendly name of the domain correlates well with the actual rocket that appears as part of the website design. This contributes to the site friendliness; part of the reason Bugrocket makes itself noticed is due to the simplicity of the interface – let’s hope it’s a thing they manage to keep as the project moves forward.